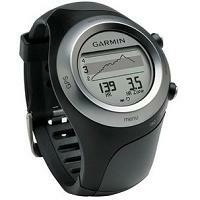 Garmin heart rate monitor watches are known for their GPS technologies. 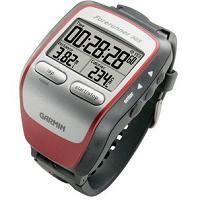 Many other heart rate monitor manufacturers produce entry-level, simple, basic heart rate monitors. Not so with Garmin. 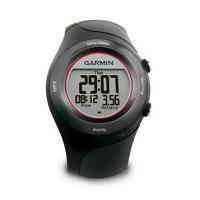 Almost every single Garmin model is a sophisticated performance measuring device. 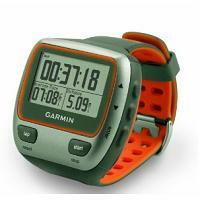 An entry level Garmin model often has features that are found only on higher end models by other manufacturers. 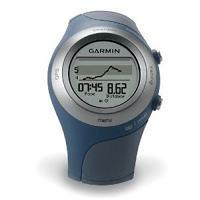 In the table below, you can read about the features of various heart rate monitors from Garmin, together with short summaries of user reviews, i.e. what users think of these models, both good and bad. Small form factor and light weight. Very easy to use. No complicated operations. Clear display of important data. 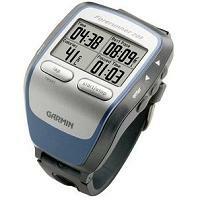 Garmin Connect online software great for reviewing the run. No instant pace. Only average pace is provided. Some users reported problems whereby the watch would freeze up while uploading data. Garmin Connect web site very helpful. Proprietary charging clip a little awkard to use. Some users reported that their watches stopped working after a short period of time. 3 data pages with up to 4 fields on each page. Time / distance / pace alerts. Nice display, easy to customize data fields and easy to read. Reasonably priced for what it is. GPS route mapping and navigation. Garmin Connect produces great reports. Short battery life for some users. Some users reported that satellite acquisition can be slow. 4 data pages with up to 4 fields on each page. Calorie counter (heart rate based). Wireless data transfer to/from computer. Swim-proof. Can be worn while swimming. Longer battery life (20 hours) than Forerunner 305. Easy, quick wireless data upload to computer and Garmin Connect site. More accurate calorie counter based on heart rate. GPS does not work well in water. Heart rate monitoring does not work in water. Elevation may not be accurate. Screen fragile according to some users. 4 data pages with up to 3 fields on each page. Wireless data transfer between Forerunner 405 units. Bezel interface. Some users find it easy to use. Nice looking and no so bulky. Can be used when not training. ANT technology to automatically upload data. Great for someone who often forgets to upload data. Bezel interface. Some users report problems with Touch bezel when it is wet or sweaty. Note: The autoscroll feature, followed by locking the Bezel, can help reduce problems with the Bezel interface while training. Some users say that the bezel interface, when locked, can easily be accidentally unlocked. ANT technology a little slow. Some users prefer a USB cable for faster data transfer. Smaller and lighter than FR 305. Touch Bezel: some users find it easy to use than button presses. Many ways to customize display. GPS can be turned off when not needed to save power. Wireless data upload to computer using ANT technology. Touch Bezel does not work in wet conditions according to some users. Note: Autoscroll (and Bezel locking) may help to reduce need to use the Bezel during training. Some users simply dislike the Touch Bezel interface and find it difficult or complicated to use. Battery life getting shorter with use. Some users have encountered durability and reliability issues. The watch cannot be completely switched off. Improved calorie counter (heart rate based). Wireless data transfer between Forerunner 410 units. Very fast locking onto satellite. Improved Touch Bezel - reacts better under wet/moist conditions. Shut down feature to conserve battery. Automatic wireless data transfer via ANT technology. Battery life becoming unstable has been reported. Certain watches suffer the problem of randomly rebooting. Some users dislike the Bezel interface and find it unreliable or tricky to use. For some, a simple USB cable to transfer data is preferable. Touch screen interface intuitive and easy to use. Works with gloves and works fine in the wet. Virtual Racer feature allows one to race against previous runs. Virtual Partner allows one to run against a static pace, say, seven min/mile. Highly customizable screen to show the data that you want to see. Vibrating alert feature for auto lap notifications etc. Power save mode to conserve battery. After a period of inactivity, it switches off the GPS automatically. The GPS can also be turned off directly. ANT technology to wirelessly and effortlessly transfer training data. Battery reverse charging issue has affected some watches i.e. the charge appears to decrease while the watch is connected to the charger. Check out this thread. Battery charger is unable to hold firmly on the watch, and hence it is unable to charge the battery. Look at this novel solution. 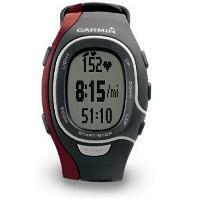 Non-GPS heart rate monitors: The Forerunner FR60 is the one Garmin heart rate monitor that does not use GPS. 5 data pages with up to 3 fields on each page. Distance / pace / calories / cadence alerts*. Foot pod (may be optional or included depending on package). Note: * requires foot pod or bike cadence sensor. Battery can be replaced by the user and does not have to be sent back to manufacturer. Foot pod can be used indoor too since GPS signal is not required. Customizable data display: 5 data pages with each page displaying up to 3 fields. Foot pod works under heavy tree cover or in area with tall buildings since it is not GPS dependent. Many types of alerts can be set. ANT technology for effortless wireless data transfer to computer. Watch band seems to be fragile as a number of users have reported that the band got broken after a relatively short period of time. Quality issues with the buttons: some users reported that watch buttons got broken or became unresponsive after some time. Chest strap generally does not work with gym machines as most machines do not support ANT. Display very much customizable to show various data. Virtual Partner a great tool for improving running times. Relative low price for its features. Some reported battery would not hold charge or watch would not turn on after some months of use. Slow satellite acquisition or loss of satellite connection during a run have been reported by some users. 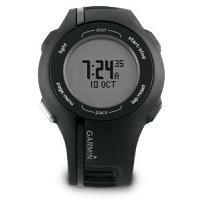 Please visit Garmin's official web site for more information. Here is a Garmin Forerunner Review which details an actual user's experience with using one of the latest Garmin Forerunner heart rate monitors.